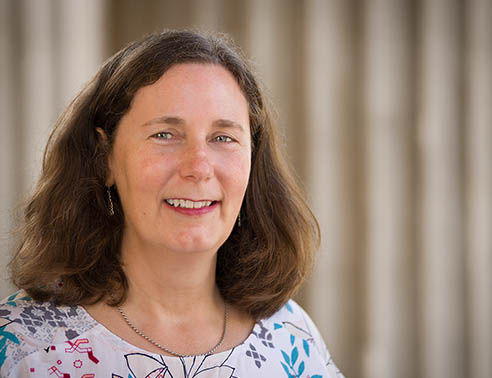 This week the Spotlight is on Dr Sara Mole, Professor of Molecular Cell Biology, LMCB Group Leader, GOS ICH Head of Section for Inborn Errors of Metabolism and Provost's Envoy for Gender Equality. I currently have two significant roles at UCL. My main role is my research as a Professor in Molecular Cell Biology where I focus on inherited neurodegenerative disorders that affect children - especially a group called the neuronal ceroid lipofuscinoses or Batten disease. I want to understand what is going wrong, and develop new treatments. My second role is as the Provost's Envoy for Gender Equality. Here UCL is building on its founding principles, essentially finishing what Jeremy Bentham started. I chair the steering group that is overseeing submission of UCL's application to renew our Silver Athena SWAN award, which recognises good practice in gender equality across an institute. Making best use of the diverse talents of everyone is essential if UCL wants to remain a world-leading institute. UCL has a rare opportunity to influence and impact the world through academic leadership in gender equality as well as through its alumni who take their experience of UCL's culture and good practice throughout the world. I have been at UCL for 25 years, when I was appointed to an unusual joint Lecturer position shared between the Department of Paediatrics (now GOS ICH) and the Department of Genetics (now GEE in Biosciences). Before that I held postdoctoral research positions at the University of Cambridge and at what is now Cancer Research UK, following my PhD at Imperial College. In terms of my research I am proud of the way I have brought together a group of labs at UCL who bring their complementary expertise to Batten disease. Together, we have made real progress in our understanding of Batten disease; its diagnosis and the development of new therapies. We also work with European colleagues in BATCure, an H2020 project I am currently coordinating. This way of working extends to what is essentially a text book on Batten disease written by international authors, for which I am the senior editor, and published by Oxford University Press (work on the 3rd edition starts soon). UCL also hosts my bespoke web site on Batten disease that contains the mutation database as well as diagnostic advice for clinicians, and information for newly diagnosed families. I am also proud of my contribution to gender equality here at UCL which began by leading my department, the MRC Laboratory for Molecular Cell Biology, through a cultural change around equality, achieving the first Silver (2009) and the first Gold (2016) departmental Athena SWAN awards at UCL. There are still only 8 Gold awards in the UK. As a Gold department we proudly represent a beacon of achievement in gender equality, sharing our good practice into UCL and beyond the UK, and we champion and take every opportunity to promote good practice to the wider community. For us it is #simplygoodpractice if we want to support and enable the best science. My efforts were recognised by a Provost's Award for Excellence earlier this year. Can I also be proud that two principal investigators that I worked for in my early career have gone on to be knighted - Professor Sir David Lane (former student at UCL) and Professor Sir Bruce Ponder. At the moment I am putting the finishing touches to an international scientific conference on Batten disease here in the UK in September. This also requires ensuring the science is accessible to Patient Organisations and Family representatives who will attend. And of course the submission for UCL Athena SWAN Silver renewal in November. I don't have a favourite album or film. But when I was working in Japan briefly as a young postdoc (before electronic books!) I took 2 books - Tolkiens' The Hobbit and The Lord of the Rings Trilogy - and rationed my reading so that they lasted 2 months. These would be my choice if marooned on a desert island. I don't really do jokes. But I do like Tim Vine's one liners - this one won the Edinburgh Fringe's funniest joke award in 2010 - "I've just been on a once-in-a-lifetime holiday. I'll tell you what, never again." My family, including those no longer with us. Then good friends because of all we have shared over the years. Work out early on what you are really good at, and keep doing it. No idea! I can think of a few things that might be a surprise, but I don't really want to find out if they are. I love walking in the mountains or in sight of the sea along the UK coastal path, or where I can hear local bird song; or watching the sun rise over Lake Tiberius. And anywhere with my husband and two children (alumni of UCL Nursery).